Induction heating is possible for CFRT only when there are closed loops for eddy current to flow. Current flowing along the carbon fibers must return back along another set of fibers. If there is a sufficient galvanic connection between the fibers due to their contact, a conductive loop is created. This is the scenario used for the examples in this paper, assuming the carbon fiber is in woven form. When there is insufficient fiber contact the only way for current to flow in a closed loop is to flow through the plastic due to capacitive coupling of carbon fibers. This can only happen at high frequencies (well within the MHz range for most polymers). In this case, additional heat generation can occur due to dielectric losses in the polymer [4,5]. In our case we completely neglect additional heating contributed by the polymer since the frequency range of interest is from .01-2 MHz. This assumption is supported by the findings of Rudolf et al. and Miller et al. .
Metal mesh has been used to help provide uniform heat distribution at the joint interface. A thin metallic foil or layer of magnetic particles could also be used. 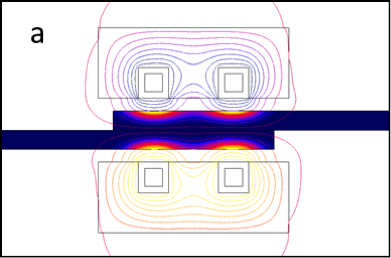 With the proper coil design and process parameters, supportive heating components at the joint interface should be unnecessary for uniform heating of most geometries. Another method to aid in the weld formation is the application of a film insert of thermoplastic at the interface of the lap joint. This method could reduce required temperature and sensitivity to applied pressure or processing time. A lower temperature thermoplastic could provide a bond without structural deformation of the base material. However, no significant advantage to the interlaminar shear strength (ILSS) has been discovered by the application of major insert methods. A comparative table of previous studies by a wide range of research groups shows the results of various methods and corresponding ILSS. This is further confirmed by the findings of Caretto . 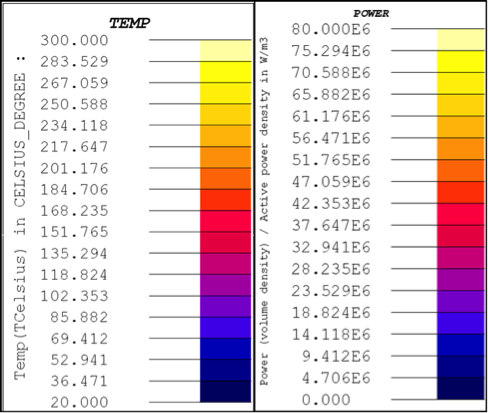 Table 1: Equivalent material properties used in the FEA. Values taken from reference . 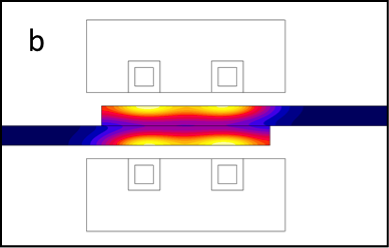 Penetration depth is a parameter that describes the depth from the heating surface that the majority of eddy currents exist. The penetration depth is dependent on the electrical and magnetic properties of the material and the frequency. Magnetic permeability is not a factor for CFRT since both carbon and thermoplastics are non-magnetic. The penetration depth (δ in m) then becomes a function only of resistivity (ρ in Ωm) and frequency (f in Hz) according to the relation in equation 1, where k = 503. Considering a total thickness at the weld overlap of ¼ inch (6.35 mm), the ratio of this thickness to penetration depth with frequency is plotted in Figure 2 by the curve labeled “1/8” panels”. The resistivity listed in Table 1 for parallel orientation is applied. 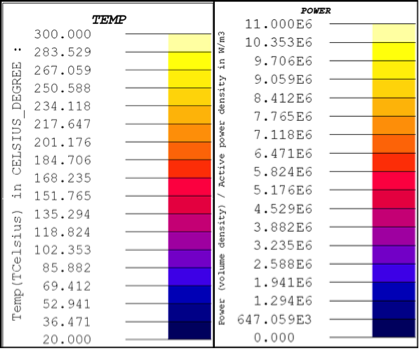 Three other panel thicknesses are also plotted for examples of what depth of heating to expect at various frequencies. 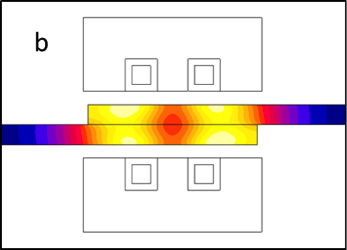 When the ratio of thickness to penetration depth (t/δ) increases, a larger thermal gradient in depth will result for one-sided heating. However, the electrical efficiency will reach a maximum when t/δ is large enough. Figure 3 shows the electrical efficiency for the hairpin style coil displayed in Figure 4. The efficiency tends to level out above 1 MHz. The relation of frequency to efficiency will depend heavily on the coil design such as: coil style, tube size, tube spacing, coupling gap, and concentrator placement. 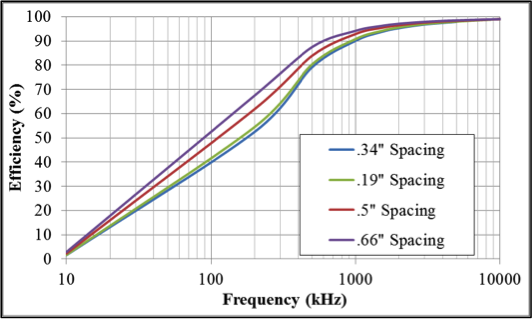 For example, the effect of tube spacing on efficiency for a hairpin coil is illustrated in Figure 3. The curve labeled “.34” Spacing” represents the case used in the results of Figure 4. For this example, as frequency is lowered below 2 MHz, the temperature gradient from the heating surface to joint interface will decrease some, but efficiency will drastically drop and eventually a point can be reached where no significant heating will occur (below 10 kHz for this case). There is no saying that low efficiency scenarios are out of the question. 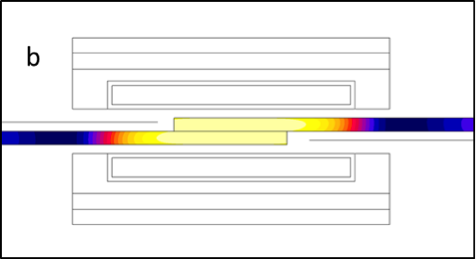 If the induction system design is limited to one-side heating only, lower frequency will improve the thermal uniformity of the weld. 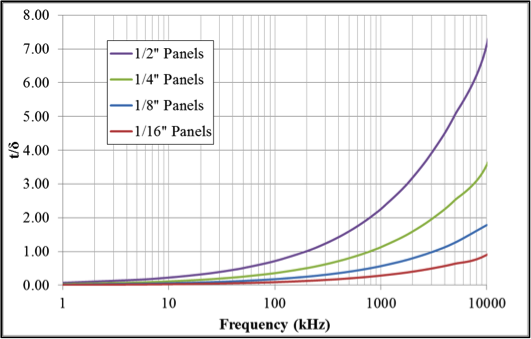 If thermal performance is more critical than the concern for power consumption, then frequencies as low as 10 kHz could be feasible for 1/8” panel thickness. 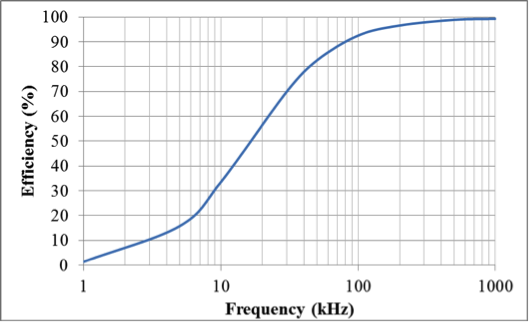 From the standpoint of the induction equipment design, frequencies below 1 MHz are more desirable. Above this range, there is lower availability of induction heating power supplies. There is also a concern of interfering with high frequency communication systems that could violate FCC regulations. 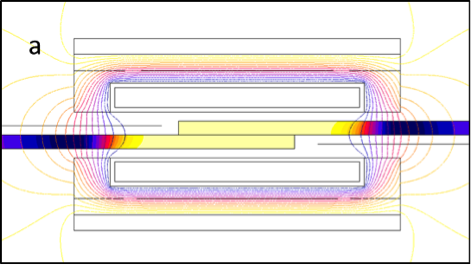 A one-sided hairpin style coil is considered for analyzing frequency and time at temperature on the thermal profile of the weld. 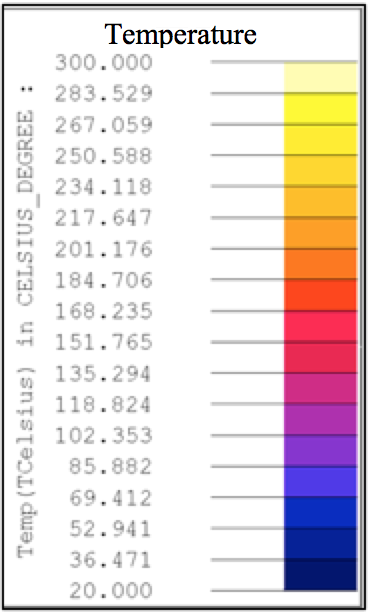 The temperature distribution in the CFRT specimen is compared at 200 kHz (t/δ = .25), 2 MHz (t/δ = .8), and 10 MHz (t/δ = 1.8) in Figure 4. 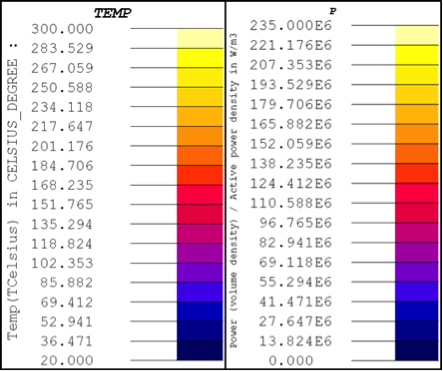 The temperatures on the left are shown after a 5 second ramp up to reach a maximum temperature of 300 °C. The temperatures at the center and right of the figure are after a 10 second hold and 60 second hold respectively, at the maximum temperature. 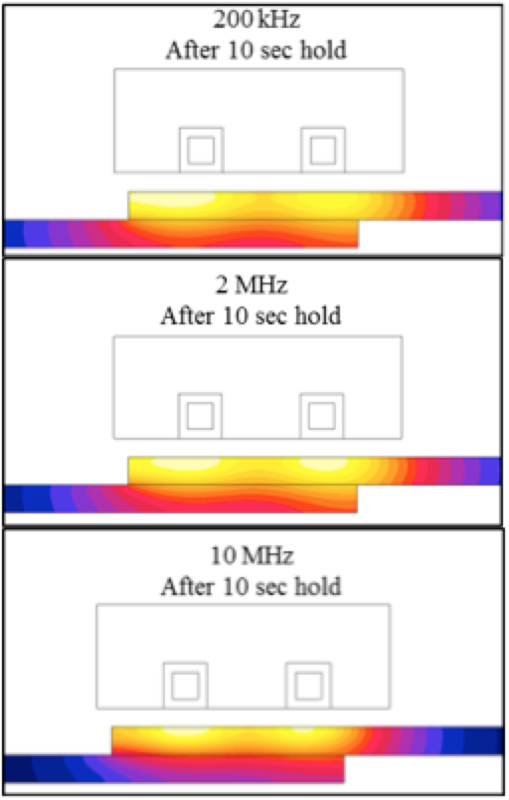 The depth of heat through the joint is noticeably larger at 2 MHz compared to 10 MHz at end of ramp up, while the efficiency is nearly unchanged (95.3% at 2 MHz, 98.7% at 10 MHz).When lowering frequency to 200 kHz, the depth of heat is even greater, but the efficiency is reduced to 52.6%. Considering the desired temperature distribution while maintaining decent efficiency, 2 MHz is a reasonable choice in frequency. After 60 seconds of hold at the maximum temperature, the heat distribution is near equilibrium and the temperature at the interface reaches a maximum within 20 °C of the target for 2 MHz. This means the surface will have to exceed the target temperature by about 20 °C after a 60 second hold to reach 300 °C at the interface. Figure 4: Temperature distribution at end of 5 second ramp up, 10 second hold, and 60 second hold for a one-sided hairpin coil at 200 kHz, 2 MHz, and 10 MHz. There needs to be a continuous electrical path within the material to observe Joule effect heating. To illustrate the differences between the resistivities of parallel versus perpendicular orientations, unidirectional fibers are represented in the test specimen geometry. 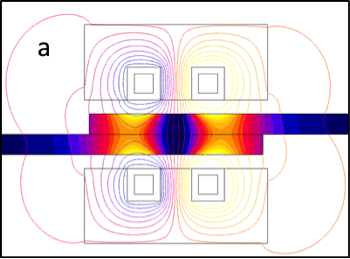 Assuming electrical resistivity in the direction parallel to the fibers, efficient heating is achieved. The power density resulting from a hairpin style coil in this direction is displayed in Figure 5a. 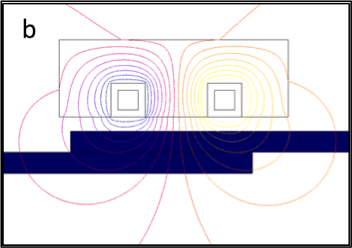 When the resistivity in the perpendicular direction is applied to the same situation, no power is induced, as shown in Figure 5b. In reality for an entirely unidirectional material, the current will have to travel through the matrix material from fiber-to-fiber in the third dimension not shown. This third-dimensional effect could reduce the net efficiency of the heating, or if frequency is low enough, will prevent heating all together for a unidirectional material. In a quasi-isotropic material with cross-plies or angle-plies of unidirectional tape, this effect needs to be considered in all three dimensions and the net heating properties will vary even further. The remainder of the two-dimensional models are under the assumption that the CFRT is woven and each individual layer has good electrical contact between all fibers. A coil wrapped around the width of the CFRT specimens (oval style) is considered. This encircling/longitudinal flux style of coil will produce opposing magnetic field on either side of the weld. 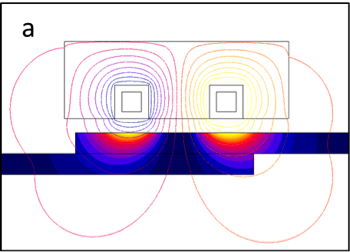 The field will penetrate the material, aligned parallel with the heat surfaces. With this configuration there will be no current traveling along the weld interface which can be seen by the power density distribution of Figure 6a. The electrical efficiency will tend to be low due to the cancellation of induced currents. The highest temperatures will be on the surface of the material with a relatively steep decline to the joint. Figure 6b shows the large gradient after a 5 second ramp up. A hold at temperature is very beneficial to the equalization of temperature near the joint, as shown in Figure 6c, after a 10 second hold. The current must return from one panel to the other, perpendicular to the joint interface with this style of coil. This may pose a challenge to maintain good contact from panel-to-panel to allow current to return between. Local overheating at the ends of the specimen will be a concern due to the high power density from current flowing in three directions. 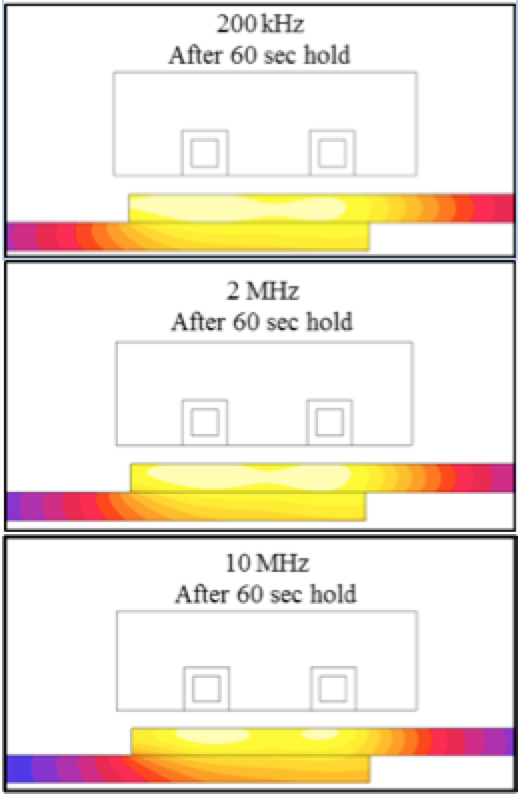 Figure 6: Power density and magnetic field lines (a) and temperature distribution at end of a 5 second ramp up (b), and 10 second hold (c) from oval style coil at 2 MHz. This coil design is similar to the hairpin coil, but applied to both sides of the specimen to create a transverse magnetic flux flow. For manufacture of this coil, the turns on each side would both be wrapped in the same direction. In this configuration the majority of current will be induced near the ends of each panel of the overlap and no current will exist in the center (Figure 7a). The magnetic field will pass through the specimen perpendicular to the heat surfaces. The heat pattern for this style of coil will result in a cooler region at the center of the weld zone during ramp up (Figure 7b). After a 10 second hold (Figure 7c), the heat distributes much more uniformly, the center of the weld fills in, and a large portion of the interface is near the target temperature. 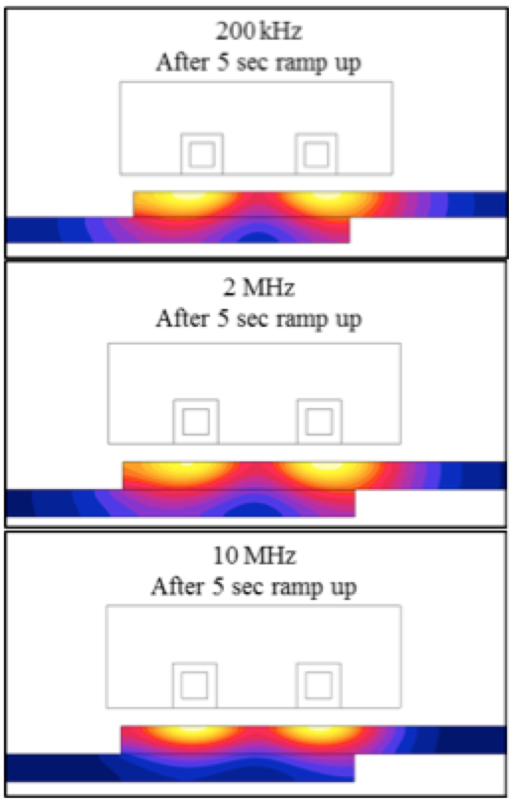 Figure 7: Power density and magnetic field lines (a) and temperature distribution at end of a 5 second ramp up (b), and 10 second hold (c) from transverse flux style coil at 2MHz. A vertical loop style coil induces the desired current in one direction along the width of the lap joint. The current in the heat face of the coil is returned on the backside of the main heating leg, which does not contribute much to the direction of return current in the part. The eddy current will split at the end of the width of joint to be heated and naturally forced to return on either side of the overlap, creating a so called “butterfly” pattern. When applying a vertical loop on both sides of the specimen in the same orientation, eddy currents can be generated uniformly throughout the cross-sectional area of the overlap. 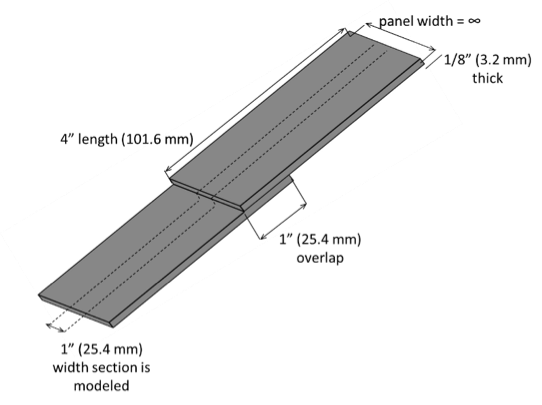 The current is then forced to return on either side of the joint, but more spread out (as long as there is sufficient panel length). The return current will add some heat outside of the weld zone, but it will be minimal due to the low intensity of the current. Figure 8: Electrical efficiency vs log of frequency for two-sided vertical loop coil at 300 kHz. Figure 9: Power density and magnetic field lines (a) and temperature distribution at end of a 5 second ramp up (b) and 10 second hold (c) from a vertical loop style coil at 300 kHz. The efficiency versus frequency for this coil design is shown in Figure 8. Optimal efficiency is at lower frequencies than with the previous designs since the cancelation of current in the weld zone is not a concern. Frequency will not have as large effect on the heat distribution as the previous designs. 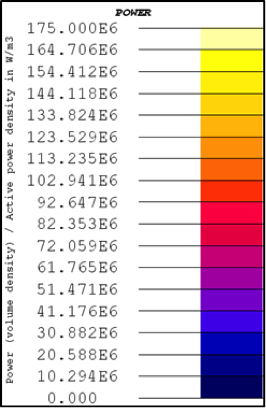 The efficiency levels out around 300 kHz for this case, which is applied to the models of Figure 9. 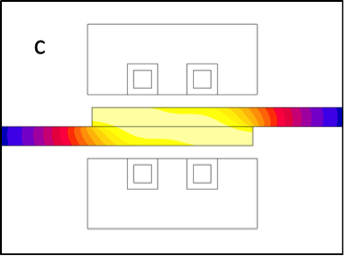 Due to the uniformity of power in thickness of the overlap (Figure 9a), the resulting temperature in the weld zone has a high degree of uniformity after ramp up (Figure 9b). 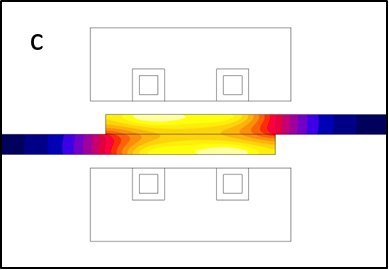 The highest temperatures are at the weld interface which is why a hold at temperature actually reduces the uniformity from conduction in length and surface losses (Figure 9c). The temperature along the 1 inch weld interface for the hairpin and oval coils are shown in Figure 10. There are three profiles for each coil: 5 second ramp, 10 second hold, and 60 second hold. Both of these coil designs have a large temperature gradient from surface to interface after 5 seconds of heat. An additional 10 seconds of holding the maximum temperature has a significant effect in raising the interface temperature and smoothing the distribution, especially for the hairpin coil. After 60 seconds of hold, the distribution is near equilibrium and the maximum temperature is within 20 ºC of the target for both coils. The interface temperatures for the transverse flux and vertical loop coil are in Figure 11. The distribution from the transverse flux coil levels out drastically after a 10 second hold and is very close to the target temperature. 300 ºC is reached at the interface with only an additional 3 seconds of hold. The vertical loop coil results in a 25 ºC difference across the 1 inch length after 5 seconds. The central 60% of the length is maintained at 300 ºC. Out of the coils examined, this is the only design where thermal uniformity is reduced with additional time at temperature. If accessibility is not an issue, the two sided vertical loop coil is ideal for rapidly reaching temperature uniformity at the joint. 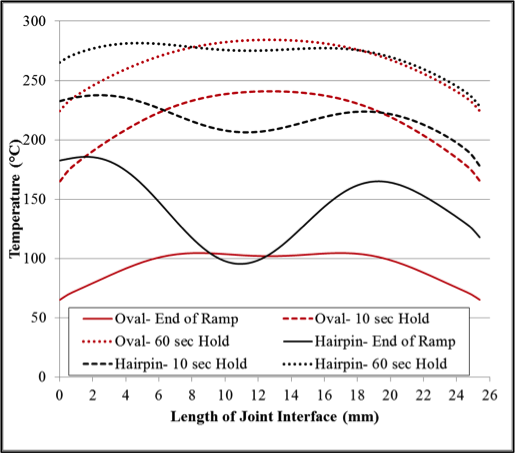 Figure 10: Temperature distribution along the weld joint interface for the hairpin and oval coils after a 5 second ramp up, after a 10 second hold, and after a 60 second hold. 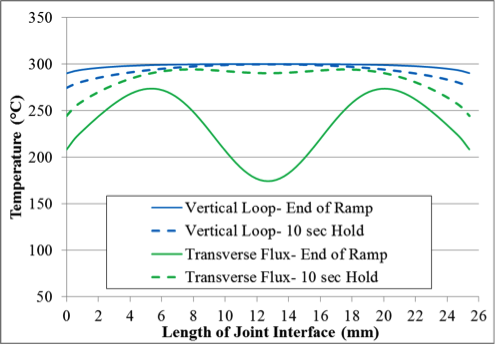 Figure 11: Temperature distribution along the weld joint interface for the transverse flux and vertical loop coils after a 5 second ramp up and after a 10 second hold. Table 2: Electrical parameters of the various coil styles. Da Costa, A.P, et al., “A Review of Welding Technologies for Thermoplastic Composites in Aerospace Applications,” Journal of Aerospace Technology and Management, Volume 4, No. 3 (2012), pp.255-265. Ageorges, C., et al, “Advances in Fusion Bonding Techniques for Joining Thermoplastic Matrix Composites: A Review,” Composites: Part A, Vol. 32, (2001), pp. 839-857. Yousefpour, A., et al., “Fusion Bonding/Welding of Thermoplastic Composites,” Journal of Thermoplastic Composite Materials, Vol. 17, (2004), pp. 303-341. Fink B.K., et al., “Induction Heating of Carbon-Fiber Composites: Electrical Potential Distribution Model,” Weapons and Materials Research Directorate, ARL, University of Delaware, USA, 1999. Fink B.K., et al., “A local Theory of Heating in Cross-Ply Carbon Fibre Thermoplastic Composites by Magnetic Induction,” Centre for Composite Materials, University of Delaware, USA, CCM-Report, pp. 90-37, 1990. Rudolf, R., et al., “Induction Heating of Continuous Carbon-Fiber-Reinforced Thermoplastics,” Composites: Part A, Vol. 31, (2000), pp. 1191-1202. Miller, A.K., et al. “The Nature of Induction Heating in Graphite-Fibre Polymer-Matrix Composite Materials,” SAMPE Journal, Vol. 26, No.4 (1990), pp. 37-54. Ahmed, T.J., et al., “Induction Welding of Thermoplastic Composites-An Overview,” Composite: Part A, Vol. 37, (2006), pp. 1638-1651. Caretto, F., “Studying the “Induction Welding” Process Applied to Thermoplastic-matrix Composites,” EAI, (2011), pp. 103-111. Goldstein, R.C., et al. “Virtual Prototyping of Induction Heat Treating,” 25th ASM Heat Treating Society, Indianapolis, IN, 2009. Nemkov, V.S., et al., “Practical Use of Computer Simulation for Advanced Induction Coil and Process Design,” 5th ASM Heat Treatment and Surface Engineering in Europe, Sweden, 2000. Nemkov, V.S., “Magnetic Flux Control in Induction Installations,” International Conference on Heating by Electromagnetic Sources, Italy, 2013. Ruffini, R.T., et al., “Influence of Magnetic Flux Controllers on Induction Heating Systems, Computer Simulation and Practice,” 21st ASM Heat Treating Society Conference, Indianapolis, IN, 2001.